Whether a photographer, artist or observer of nature consider these few suggestions for discovering ways to capture, as well as learn about, nature that is in front of us everyday. While travel often heightens our senses to novel experiences and new worlds, what we have before us offers just as many serendipities. Exciting discoveries await us in our everyday experiences. 1. Explore your own back yard. Typically when traveling, there’s little time for photographing complex eco-systems and micro-worlds. Grand landscapes understandably command most of the photographer’s or artist’s attention. Our local neighborhoods, however, offer opportunities to study over time the many niches that nature fills in our back yards or community parks. Caved out of farm land during the early 1950’s building boom, my neighborhood retains a small wooded area in the back yards. Most of the land surrounding the neighborhood has been developed, but a number of parks and preserved lands nestle between the housing developments, strip malls, office buildings and roadways. Despite the suburban encroachment, a number of animal species live here or visit from time to time. White-tailed deer graze through the forest and sometimes come near the house to find salad fixings in the hostas. Occasionally, a red fox trots through and groundhogs appear once in a while. Regular visitors include chipmunks, mice, voles, moles, squirrels, toads and rabbit. Bird species observed are wrens, chickadees, woodpeckers, humming birds, robins, crows, starlings, grackle, nuthatch, titmouse, chickadee, blue jay, cowbird, cardinal, morning dove, house sparrows and goldfinch, catbird, mockingbird, junko, and red-tailed hawk. The natural ecology of our yard falls apart at the ground level where English Ivy has taken over and blocked the natural succession of indigenous plants. Someday I would like to pull it out and allow the woodland flowers to come back. 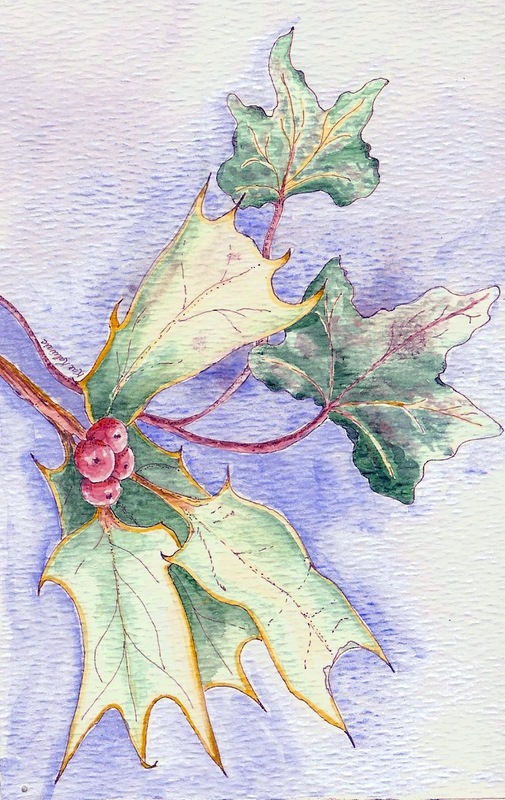 Another invasive species that has been successful is the Holly, as seedlings often find homes in the soil in the woods and cultivated gardens. Finding any redeeming qualities in these is difficult, but it is possible to glean a few advantages from their presence. These plants are great subjects for art projects, even if just a simple water-color painting. In addition, instead of purchasing greens, the holly and ivy provide greenery for wreaths and garlands. Another plants that sometimes overtakes the garden is the Sweet Pea. The delicate pink flowers and fine little threads make a great subject for a pen and ink. Enjoy the fragrance but be advised to not eat the little peas that it produces. 3. Check the debris piles after a rain. 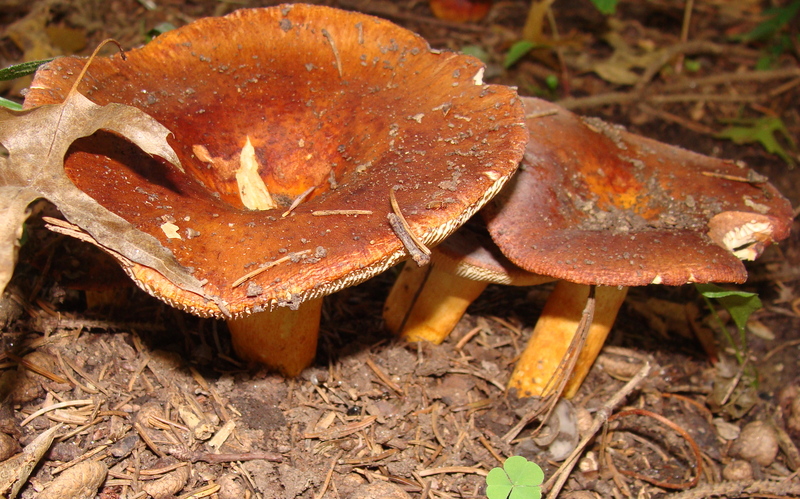 When the ground is damp and boggy, that’s a good time to check for unusual species of mushroom that grow from the forest debris. On a particularly humid day, these two mushrooms grew from the dampened soil. Indian Pipe, also known as the “Corpse Plant,” grows in rich soil often under pines. 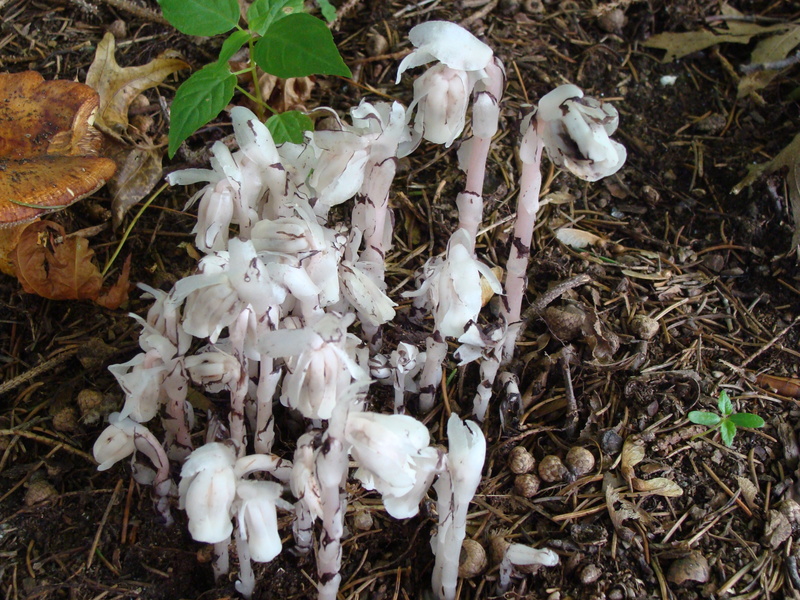 Indian Pipe attracts bees providing a food source for them. I could not definitively identify the orange mushrooms. Let me know if you know the name. 4. Spend time observing a small environmental niche. I almost missed this little guy hiding in a tree nook. He seems to understand camouflage pretty well and found some moisture there, as well. 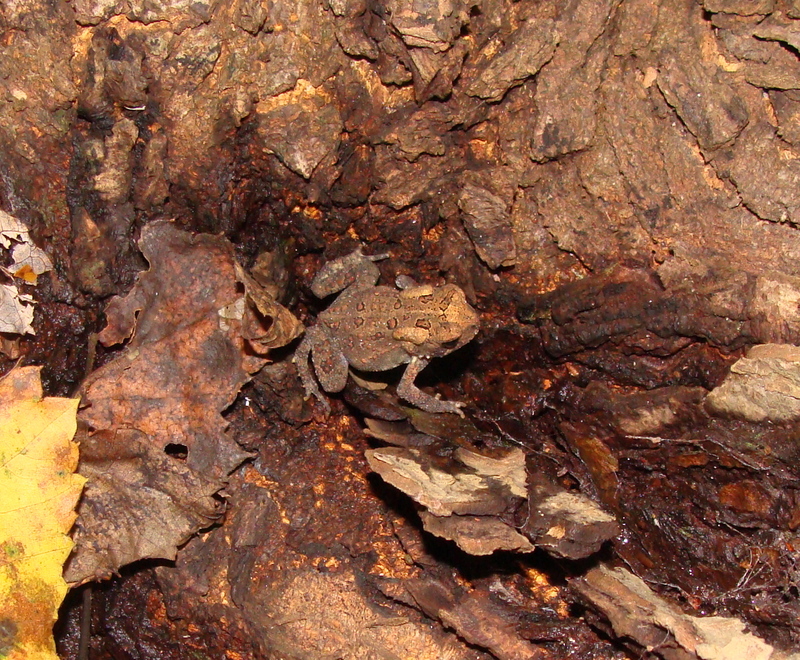 The American toad is common, but only two species of toads live in Pennsylvania. 5. Study the frequent visitors to the yard. Often we look for the exotic, but even common species offers spectacular results and opportunities for experimentation. 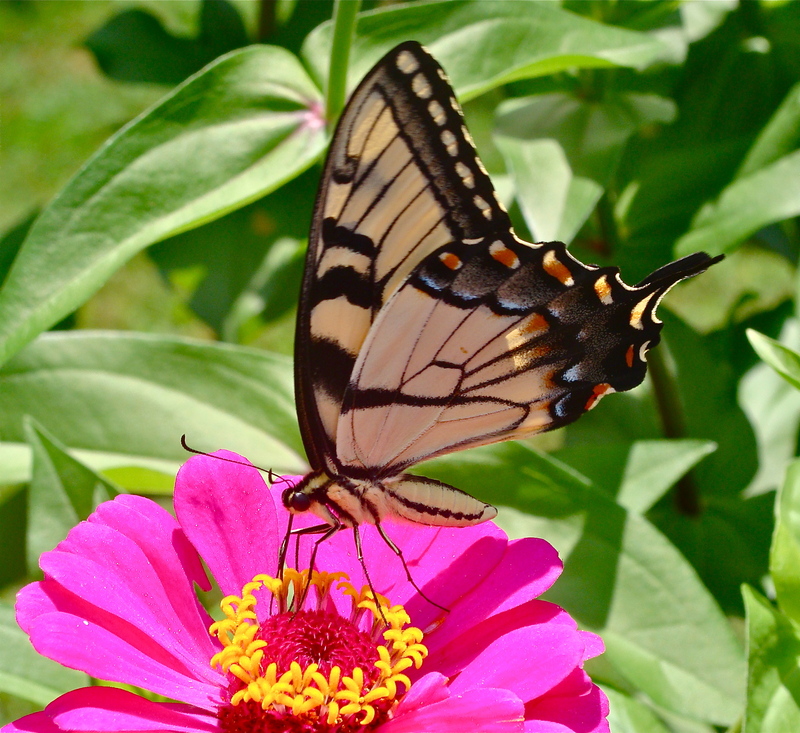 The Eastern Swallowtail is one of the most common butterflies in this part of the country. The bit of blue on her wings identifies her as a female. According to Wikipedia, the species prefers red or pink flowers. Really. Photographing common species provides the opportunity for practice when that exotic comes along. 5. Remember that late fall also provides artistic opportunities. Sure “all the leaves are brown and sky is gray” but late autumn offers a unique view of patterns and textures. The Chinese Lantern, a weed that often crops up in the yard, displays charming lantern-like seed pods. A member of the potato family, the Chinese Lantern supposedly has herbal uses, although requires some care and knowledge to use properly. 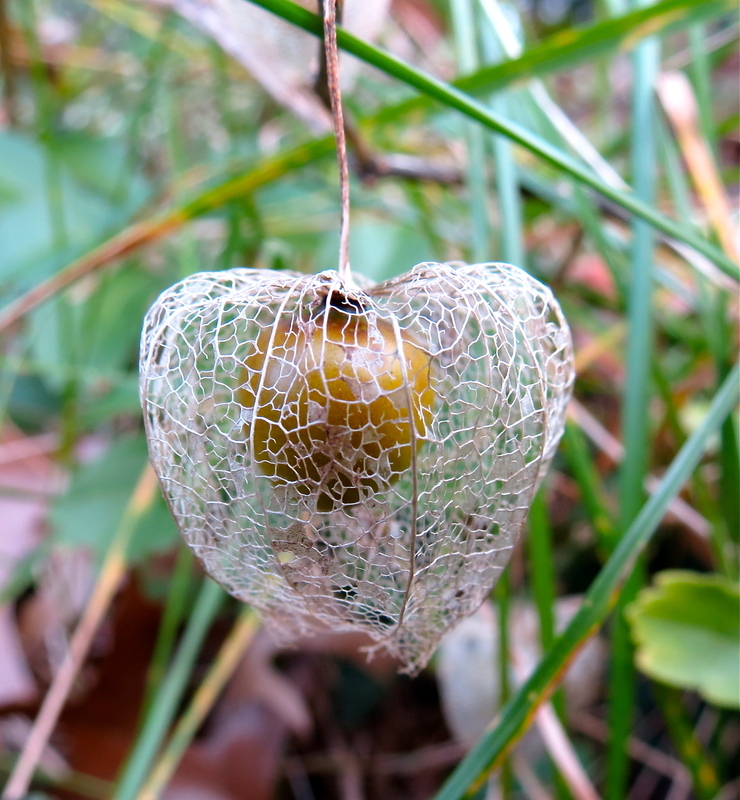 In the fall the lantern transforms to lace revealing a golden seed tucked inside. By the Fall the hydrangea flowers have dried, and although I like to bring the puffy floral balls inside, our cats find them tasty but later regret the urge. 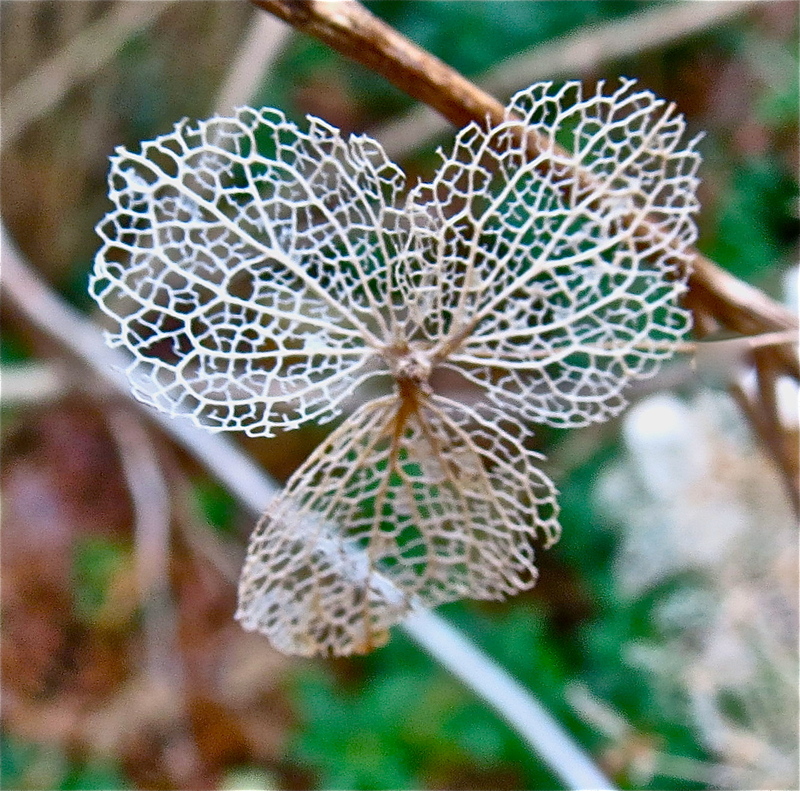 Like the lacy lantern, by late November the tiny flowers keep only their veins displaying their infrastructure pattern. Free of their covering and color, the design of their pedal foundation becomes clear. 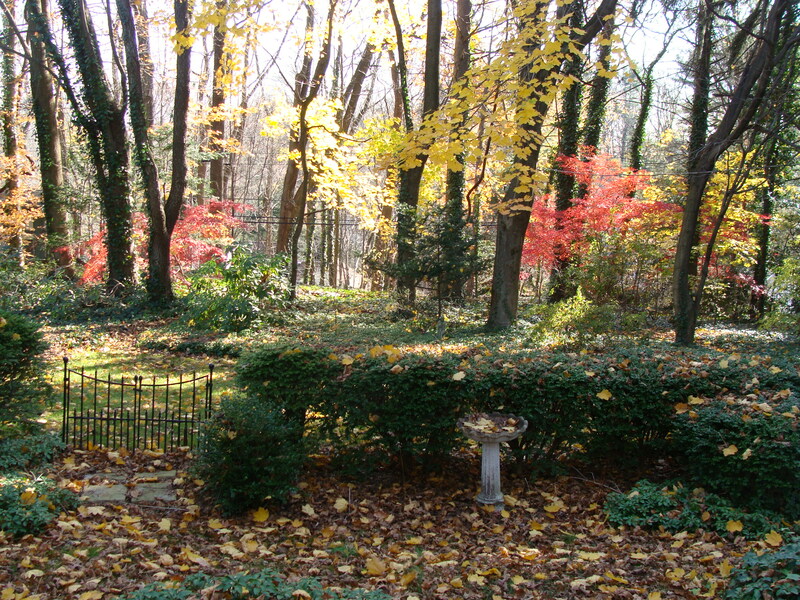 Observing nature in our neighborhood provides the opportunity for reflection and revelation. On this backyard exploratory a revelation came to me about perseverance. Whether plants or animals, all have found a way to survive and preserver. The ivy doesn’t know it’s an invasive. Weeds come back despite efforts to eradicate them. Creatures find places to live in nature’s crevices. 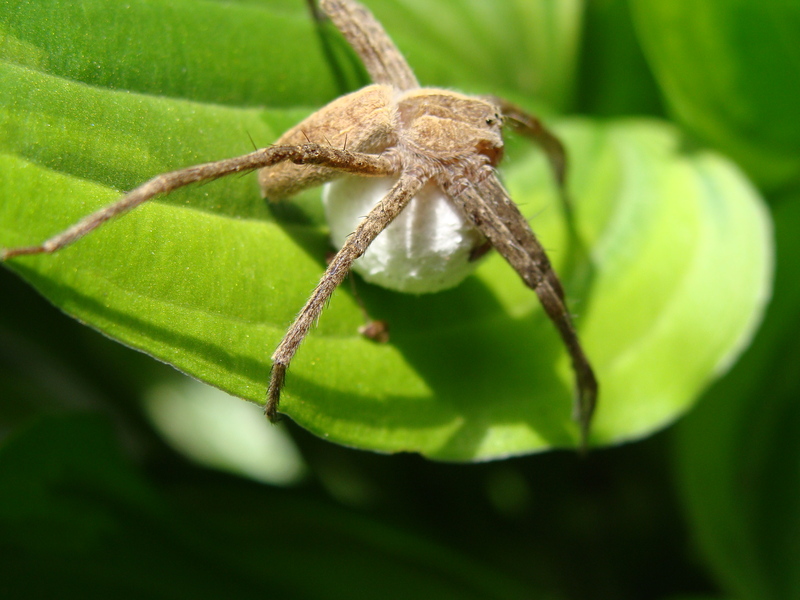 The spider will carry that egg sack everywhere in her garden home, and the Swallowtail will find that pink flower. Maybe what amazes us is that we share that quality with all life.